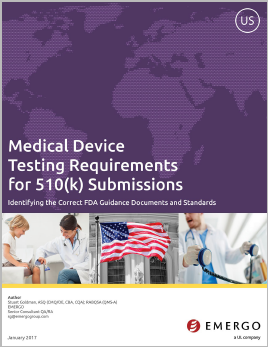 Are you preparing a 510(k) submission to the FDA? If so, have you identified the correct testing standards for your device? Finding the right testing requirements can be a challenge. And, failure to do so could result in a longer 510(k) review time if the FDA sends an Additional Information (AI) Request. If you cannot provide the requested test data in a timely manner, you might even have to withdraw your 510(k) submission. You'll learn all this and more in this 24-page white paper. Stuart Goldman is a Senior Consultant at Emergo with 25 years of experience in the medical device industry. Before joining Emergo in 2006, he spent the first 15 years of his career involved in various quality functions for a leading manufacturer of high-risk cardiovascular implants and instrumentation. He now focuses on medical device regulations for the US and Europe. Stuart’s areas of expertise include medical device classification and regulatory strategies and submissions; medical device testing requirements and FDA Warning Letter responses; and QMS audits. Stuart has worked on FDA submissions for a wide range of devices, with a focus on dental, orthopedic, radiological, electrosurgical, general surgical, and personal use products. He has a Bachelor of Science in Materials Science and Engineering from North Carolina State University.